The Trial of Socrates - HISTORY'S HISTORIESYou are history. We are the future. 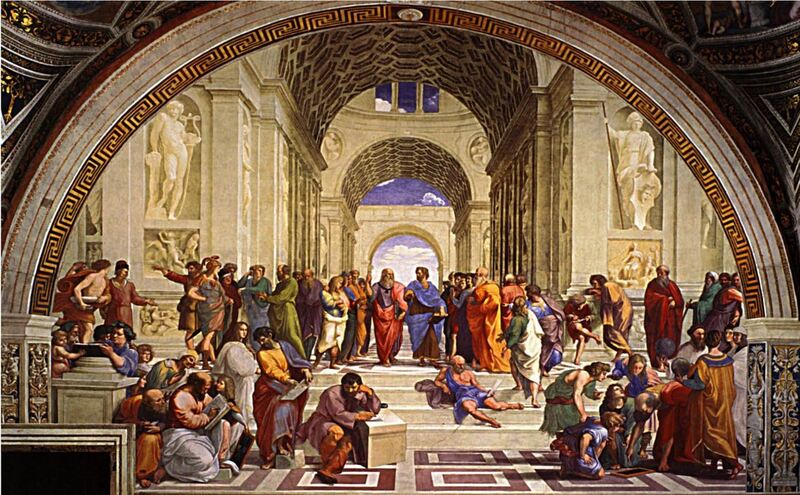 Raphael’s great painting, “The School of Athens,” depicts many philosophers who trace their education back to Socrates. What responsibilities does an individual have to their community? 1. Not honoring the gods of Athens. ​2. Corrupting the youth of Athens. Socrates: Socrates was born around 470 BCE. He was brought to trial and executed in 399 BCE. Socrates was the first of the three major Greek philosophers; the others were Socrates’ student Plato and Plato’s student Aristotle. Aristotle, by the way, also had a pretty famous student; he was the private tutor to Alexander the Great. Socrates was well known in Athens. He was exocentric. That means that he was extremely outgoing. He was also what we might politely refer to as "something of a character." Socrates claimed to hear a divine inner voice that he called his daimon. He was also prone to go into such deep states of concentration that he became immobile. One story tells of the time that Socrates was late for dinner at a friend’s house. Because Socrates could sometimes be somewhat absent-minded, his tardiness did not surprise his hosts. So, they didn’t worry. At first. As evening fell and a chill brought snow to the area, however, the hosts became more concerned for the well-being of their friend. Setting out to search for Socrates, when they opened their door they found him in one of his deep states of concentration, standing mid-knock on their doorstep. Socrates was poor, and many considered him to be ugly. However, he was also considered brave, stoic, and even-tempered. During the Peloponnesian Wars, he distinguished himself for his apparent indifference to the discomforts of war and he received military honors for fighting bravely on behalf of Athens. While Socrates was not politically active, he was no fan of democracy. He believed that most people are not interested in what is "best" but are, instead, interested in simply what is best for themselves. As a result, he thought the city-state should be ruled by "he who knows." In other words, he thought that the city-state should be ruled by a "philosopher king." Some of the followers of Socrates, including a former student, were involved in a reign of terror. That time period is called the time of the "Thirty Tyrants." Socrates' association with the Thirty Tyrants contributed to his prosecution and subsequent execution. Oracle of Delphi Story: In a famous episode from Socrates' life, he and a friend named Chaerephon visited the Oracle of Delphi. In ancient Greece, Delphi was a religious sanctuary dedicated to the god, Apollo. The Oracle of Delphi was a priestess who gave advice on all types of questions large and small, from when to plant seeds to when to go to war. Upon their arrival in Delphi, Chaerephon asked the Oracle if anyone in Athens was wiser than Socrates. The Oracle answered that no one in Athens was wiser than Socrates. After that visit, Socrates made it his mission in life to pursue wisdom. Socrates made that claim, however, not because he possessed any special knowledge. Instead, he reasoned that he was the wisest because, in himself, he recognized his own lack of knowledge. "While others think they know, but do not," he said, "the one thing I am certain of is that I do not know." Socrates, however, does not deny that knowledge can be had. While he does not claim to have knowledge himself, by demonstrating a method of testing the claims of those who say they possess knowledge, he shows us how to obtain it. Dialectic: Socrates' method of teaching (and arguing) is called the dialectic method. The dialectic method is a way to test claims of knowledge. As such, the dialectic method provides a test of concepts. Putting his dialectic method to work, Socrates considered how someone else viewed a situation. Then he raised objections or offered examples that disagreed with the person’s stated view. In order to respond to Socrates’ objection, the first person was forced to change their position. Socrates would then raise more objections that forced the other person to, once again, reconsider their position. By continuing this process, Socrates eventually brought his opponents over to his point of view. Socrates used the dialectic to discredit others' claims to knowledge. While revealing the ignorance of others, Socrates demonstrated how to make progress towards more adequate knowledge - and, in the process, bruised a lot of egos and made many enemies. The dialectic, or "Socratic method," is still taught in many law schools today. The Royal Stoa in Athens, above, is where Meletus presented his charges against Socrates. Chaerephon: Early in Socrates’ life, before he became a teacher, he and a friend named Chaerephon visited the Oracle at Delphi. There, Chaerephon asked the Oracle who was the wisest man in Athens. The Oracle replied that Socrates was the wisest man in Athens. After that exchange, it is said that Socrates devoted his life to philosophy – the love of wisdom. Socrates never claimed to be wise. Of course, neither did the Oracle. Instead, she simply called him the wisest. Socrates, in fact, claimed that he was ignorant. He claimed that the only thing he knew for sure was how little he knew. In order to know more, he developed what is now known as the Socratic Method. The Socratic Method consists of asking a series of questions designed to point out inconsistencies in someone else’s beliefs. Unfortunately, as you might imagine, Socrates wound up embarrassing a lot of fellow Athenians. Famous Athenian Generals were shown not to know what courage was. And, statesmen were shown to lack knowledge of justice. One other thing that got Socrates into big trouble was his belief that Athens should be run, not as a democracy, but as a monarchy whose leader was a “philosopher king.” He thought, logically perhaps, that only the wisest should rule. Plato’s most famous student was Aristotle who wrote books on Politics, Ethics, Art, and the Theater. It is to Aristotle that so many of our thoughts on those subjects can be traced. In turn, Aristotle had his own famous student, Alexander the Great. Meletus - the "Principal Accuser:" A poet named Meletus started the prosecution against Socrates. Most scholars, however, think he was acting on behalf of the best-known and most influential of the three accusers, Anytus. Meletus brought two related charges against Socrates. For the first charge, Meletus accused Socrates of "refusing to acknowledge the gods recognized by the State and introducing new and different gods." For the second charge, Meletus accused Socrates of "corrupting the youth of Athens." During the first three hours of the trial of Socrates, Meletus and the other two accusers each made speeches to the jury making the case for the guilt of Socrates. The motivation for Meletus to bring charges against Socrates is a matter of debate. His motivation may have sprung from his religious fanaticism or from his anger over the association of Socrates with the Thirty Tyrants. It is also possible that he was upset with the low opinion that Socrates had for poets. In Plato's Gorgias, Socrates accuses poets and orators - those who make speeches - of flattery. In other words, Socrates thought that they were liars. Anytus - the Power Behind the Prosecution: Anytus was a powerful, middle-class politician. He is considered to have been the driving force behind the prosecution of Socrates. Prior to his political career in Athens, Anytus served as a general in the Peloponnesian War. During the war, Anytus faced charges of treason for losing the city of Pylos to the Spartans. With the help of a well-placed bribe to the jury, however, he was found not-guilty. Anytus became influential in Athens when he played a leading role in the democratic revolt that overthrew the Thirty Tyrants. Despite having lost property and money during the eight-month rule of the Thirty Tyrants, Anytus made no attempt to compensate himself for his losses, thus earning additional public favor. The motivation of Anytus to prosecute Socrates is believed to have grown out of his concern that Socrates' criticism of Athenian institutions endangered the democracy that was so recently reestablished after the reign of the Thirty Tyrants. Socrates, knew several persons associated with the Thirty Tyrants and their overthrow of Athenian democracy in 404 BCE. He also made no secret of his dislike for politicians such as Anytus. Even after democracy was restored, he continued to ridicule aspects of democracy, such as the selection of leaders by a “majority-rules” vote. In Plato's Meno, Socrates answers questions about learning and virtue. In his work titled Meno, Plato offers some clues about the bad feelings between Anytus and Socrates. In the Meno, Plato shows Socrates arguing that the politicians of Athens are incapable of demonstrating what virtue is. That enraged Anytus. In a statement that serves as both a warning and a threat, Plato quotes Anytus responding to Socrates, "I think that you are too ready to speak evil of men: and, if you will take my advice, I would recommend you to be careful." Anytus had an additional personal gripe with Socrates. Socrates had a relationship with the son of Anytus. Plato quotes Socrates as saying, "I had a brief association with the son of Anytus, and I found him not lacking in spirit." Given their differences, Anytus almost certainly disapproved of his son's relationship with Socrates. Lycon - the Third Accuser: Little is known about the third accuser, Lycon. He is described as "an orator," or one who makes speeches. That was another profession that Socrates held in especially low regard. Socrates believed that orators were more concerned with using their speech-making skills to gain power and influence, rather than to pursue the truth. Diogenes Laertius was an ancient biographer of Greek philosophers. Writing in the third century CE, Laertius called Lycon a "demagogue" who "made all the necessary preparations" for the trial. Laertius' use of the word "demagogue" suggests that Lycon may have been a strong supporter of the “common man.” As a supporter of the common man, it’s likely that Lycon believed Socrates was a threat to the democracy that he valued so highly. And it’s as easy as one, two, three! ​One of the ways to prove your point beyond a reasonable doubt is to use logic. Logic is a process that uses a sequence of statements to get to a conclusion that is really hard to deny. Use this exercise to prepare for your examination and cross-examination of witnesses for the Trial of Socrates activity. Instructions: Logic uses If-Then statements to prove or disprove a conclusion. It can be a powerful tool in the courtroom. If-Then statements can help guide the jury to your side in the court proceedings. Because of that, I want you to practice creating strong If-Then statements. If-Then statements actually have three parts. 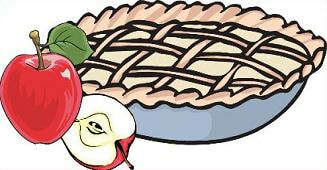 3) Then I should make my apple pie in the Fall. Appreciate that it is hard to argue against that logic. Then I should make my apple pie in the Fall. Your Goal: Remember your goal in this activity is to produce an argument (or several) that proves your point. Depending on whether you are the Prosecution or the Defense, you are trying to convince the jury that Socrates is guilty (Prosecution) or innocent (Defense) of the charges. Because of that, at all times you should be mindful of the charges against Socrates. Each witness in the Trial of Socrates is best suited to address one of the charges or to serve as a “character witness” - someone who can speak to what type of person Socrates is. So, before you begin forming If-Then statements, decide which witness fills each role. If you need to, review the witness biographies before you begin. When deciding which charge each witness is best suited to address, think about how they know Socrates and what types of interactions they have had with Socrates. Above, the three defenders and accusers of Socrates. From Left to Right, Chaerephon, Plato, Aristophanes, Meletus, Anytus, & Lycon. 2. Corrupting the youth of Athens. 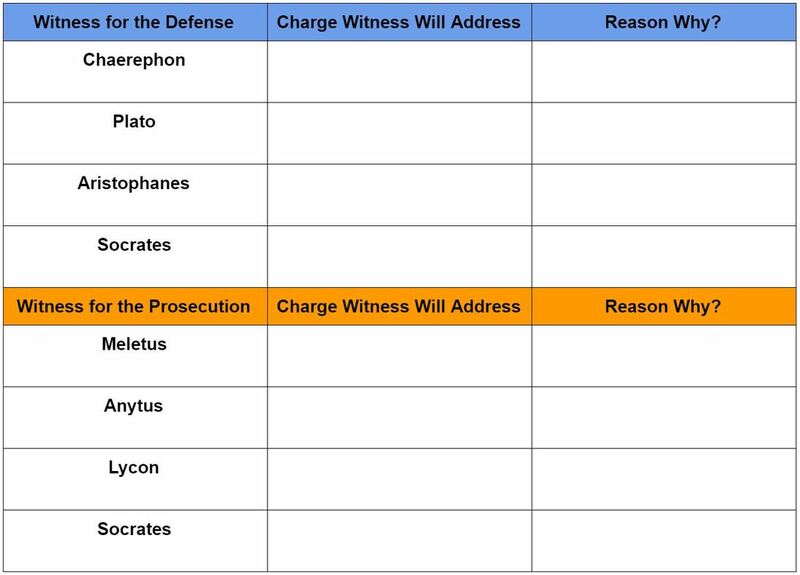 Before finding out what role you will play in our Trial of Socrates, you will create If-Then statements for each witness and about each charge. More, you should create those statements for both the prosecution and the defense. If you want a real challenge, think about the charges against Socrates and use the biographical information for the witnesses to come up with If-Then statements on your own. And, if you want a bit of help creating your statements, try matching statements from those in the table below to form the If, the And, and the Then portion of your statements. Note: I have not indicated which statements are ‘Ifs,’ ‘Ands,’ or 'Thens.' That decision is up to you. Remember: The following are only possible If, And, and Then statements. 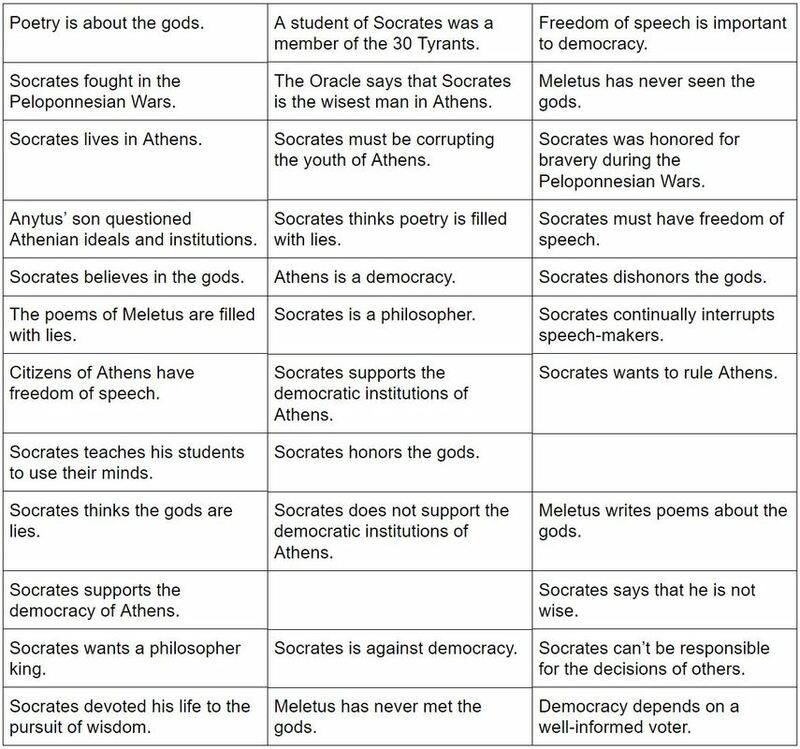 You must decide how each statement will combine with another statement to prove either the guilt or innocence of Socrates. That means you must decide not only which witness your statement belongs to but also if the statement you create serves the goals of the prosecution or the defense. Note: You may use the same phrase from the table below for more than one If-Then statement. If you download this document and make a copy of your own, you can copy and paste the statements into the chart above.